Gulzar Books & More is located in Falcon Mall Block A Civic Centre Bahria Town Phase 4, Islamabad. It deals in all kind of School, College & University Books, O/A Level books, Computer books, Islamic books & Other General Books. 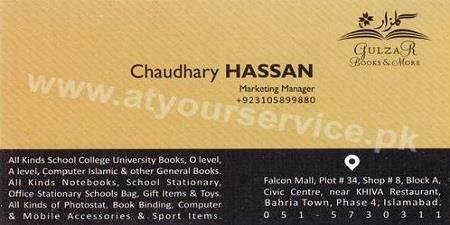 One of the best book seller in bahria town.